It's not all nuts and bolts. You never realize how important dialogue is until you read through something you’ve written and realize there’s no way anyone on this planet would speak in such an incessantly gaudy way. Dialogue isn’t supposed to make a reader stop and question a character’s realism. It’s supposed to be a vehicle for storytelling and character development. When utilized to its fullest potential, dialogue is a remarkable tool that can be shaped and conformed to fit any story’s specific needs. If you want your novel to take place in a Victorian Era city, your dialogue would sound much different than if it were to follow the exploits of a thug growing up in modern day New York. You see, it can provide insight into a story’s setting just as easily as it can exemplify a character’s personality and key traits. Knowing this, it’s easy to assume that the possibilities of what dialogue can do are far greater than even I know. Here are some of the ways I try to use it to its fullest extent. By far the most obvious use of dialogue is characterization. The way a character speaks says a great deal about who they are. For instance, a boy who speaks in short, spastic sentences might be labeled as hyperactive and annoying. On the other hand, a boy who always uses long sentences and extravagant words might be considered arrogant and coy. The subtle in between, a boy who speaks naturally in colloquialisms and knows precisely when to shut up, will be portrayed as average and realistic. Another thing to consider is the power of curse words. In society it’s common to hear these flagrant attempts at badass-ness spewed in everyday conversation, but they speak volumes of the person using them. Someone who freely uses such vernacular can be viewed as lacking morals, whereas someone who only uses questionable language in intense situations is probably impulsive. -> I’ve done a few things here. First, by using Lucas’ nickname when she hasn’t up until that point, it’s made apparent that Silvia has a softer side. She’s let her guard down because she’s honestly worried about Lucas. -> As everyone can probably tell, Lucas would like to think of himself as a comedian. Whether he is or isn’t is something for you as a reader to decide, but I’ve done more than just show that side of him here. I’ve also suggested that he’s not someone to let things go. Considering only minutes before he’d almost been engulfed by a raging inferno, it makes sense, but the way he uses snappy humor to cope with it says more about his personality than any description could. Dialogue tags are every writer’s worst nightmare. At least mine, anyways. They’re the action word we use to show when someone is speaking. They can be as simple as “said,” or as descriptive as “choked,” but either way they are used to further explain how the speakers say whatever it is they say. Personally, I’ve heard many complaints about my use of dialogue tags. You’re using too many. They’re not varied enough. They’re too varied. Anyone who uses a dialogue tag other than “said” or “ask” obviously doesn’t know how to write. Well, you’re wrong. I’m sorry, but you are. There’s no “right way” to write. Sure, some ways are more effective than others, but every writer has their own personal style and I’ve read such a variety that I honestly don’t care one way or the other, as long as it’s engaging. “Hi.” Suzie smiled and shook my hand. “Hi,” said Suzie, smiling as she shook my hand. I feel this more actively expresses the character’s (Harland’s) actions and flows better than if it were to use a dialogue tag. So, in this case, less can certainly be more, but as with everything it’s about finding the perfect in between. Dialogue is also a perfect way to explain something about your story without taking a few long, drawn out paragraphs to do so. As long as it sounds natural and could potentially come up in ordinary conversation, an exchange between two, or even a few characters is the perfect way to avoid the dreaded “info dumps.” Let's face it, a conversation between friends, two people who are romantically involved, or even arch nemeses, is going to be much more interesting to read than three pages worth of dry exposition. It's simple. Utilizing dialogue effectively makes a story more interesting to read. 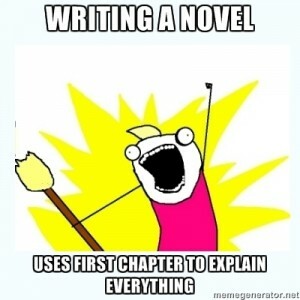 Some of my favorite authors use it in ways that were both original and engaging. Take Cormac McCarthy, for example, and his novel No Country for Old Men. In the book, he used dialogue is used to a great extent, the only difference being that he rarely used any tags at all and when he did they were simple and concise. If you haven’t read the book I suggest you do, because it’s interesting to experience varied styles and fills your own writer’s toolbox with skills for later use. I’ll leave you with one of my favorite quotes from this book, which speaks volumes of the power of perfect dialogue. . .
PS, if you hadn't noticed, Chapter Three is uploaded. Read at your leisure! This entry was posted in Writing Workshops and tagged Characterization, Dialogue, Speech. It's so true that dialogue is an interesting way to develop character--and sometimes exposition isn't. Over the weekend I read a book that had no dialogue between characters until page fourteen. There were thirteen full pages of exposition, and I almost gave up on the book! For me, the story didn't come to life until the characters started talking. 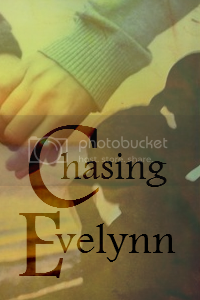 Chasing Evelynn This is what I’ve always wanted – a miracle. How can you tell me it’s wrong?